Kensington Market patios are perfect if you're looking for a laid back retreat in one of the most unique neighbourhoods in the city. There are a variety of low-key, casual spaces to choose from, ranging from sidewalk spots perfect for people watching to more secluded or hidden backyard haunts. 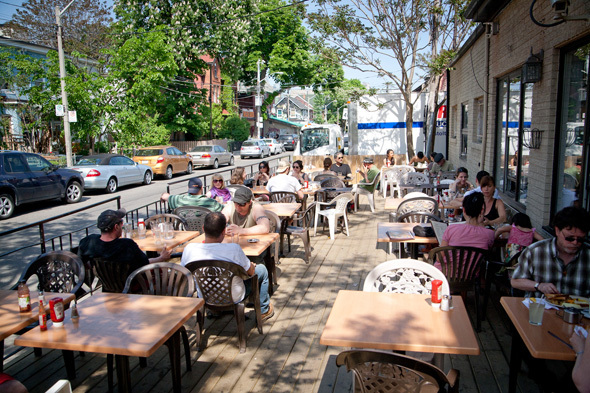 Here, in no particular order, are my picks for the top patios in Kensington Market. For more patio ideas, check out our Toronto Patio Guide or download our iPhone or Android app. Trinity Common's front patio is a perfect people watching spot. The picnic table seating matches the casual vibe of the neighbourhood and is an all-around great choice if you want to sip some craft beer and chow down on smokehouse grub. The Cold Tea patio is Kensington's best worst kept secret. It boasts long communal tables, making it ideal if you've got a big group of friends. 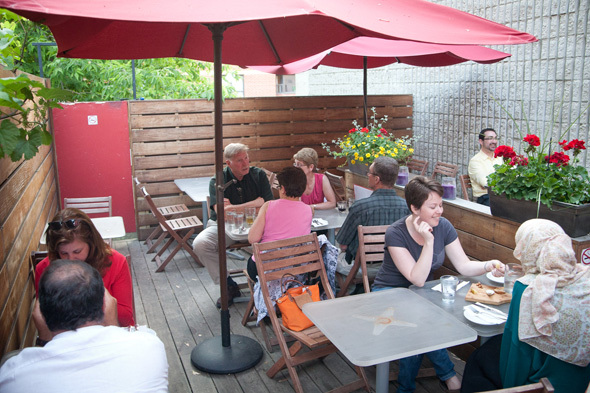 They often throw patio parties during the summer with DJs and food provided by a local eatery. The Last Temp is a Kensington classic. The drinks and food are cheap and the branded umbrellas and plastic patio furniture add to the no fuss no muss vibe. Its location on Kensington Avenue situates it more among the vintage shops than the main drinking drags of Nassau or Augusta. The popular lunch and brunch spot flaunts one of Kensington's larger patios, with enough seating for 65. Prices are on the cheaper side making it a good option for students or those on a budget. A good bet in the evenings, this patio may be on the small side but when there's live music inside you can still hear the bands playing on the stage as the large front windows next to the patio are usually open. It can be tough to snag a seat on this neighbourhood old and faithful. The sun-drenched front patio is the ideal place get your daily dose of vitamin D as there are few umbrellas and very little shade. When night falls, Poetry Jazz Cafe may be your best bet. Head to the back for one of the more refined patios in the area and a good spot to savour a cocktail while listening to the live music coming from within. This low-key, budget-friendly (everything is under $10!) hangout is a good option if you're craving pub grub but still want to soak up the sun. Grab a burger and a sangria and watch the market action from the north end of Augusta. Torito is definitely the wildcard when it comes to patios in the area. The backyard space offers a Spanish escape from the bohemian marketplace. Serving tapas and sangria, this is the place to go if you're looking for a less rowdy crowd. Handlebar's small front patio is a craft beer haven. Featuring a few wooden tables and bench-style seating around its perimeter, this is where it's at if you're with a smaller crew. Grab an obscure IPA and embrace Kensington culture to the fullest. Thanks to Strongbow for sponsoring our 2015 Toronto Patio Guide. Did I miss any? Add your favourite Kensington Market patios to the comments.